It’s the first day of the weekend so it’s time for our Saturday Sales Recap. We’ve been tracking eBay sales for the past week, a really good indicator of true street value prices. As 2015 Topps Series One Baseball cards sales are moving briskly on everything thing from sets to singles, prices have leveled off. 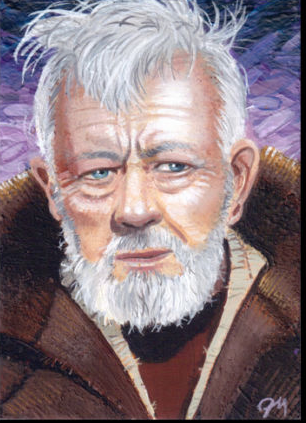 What has hit like an explosion is the release of 2015 Topps Star Wars Masterwork cards. Configured much like Topps Museum, these high end cards arrived in master boxes with for mini boxes, but what was inside has sent card collectors and Star Wars fans abuzz. 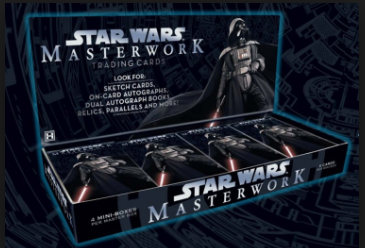 Let’s take a look at some of the best sellers for Star Wars Masterworks and 2015 Topps Series One Baseball. 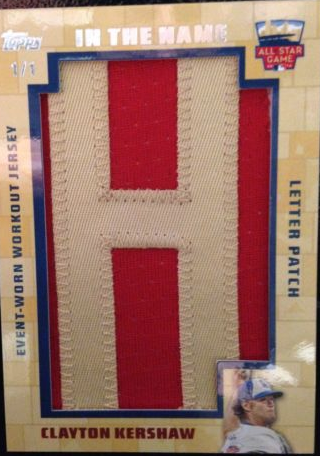 Super seller BrentandBecca still holds the top spot with this 1/1 letter patch taken from an event-worn workout jersey sold for the highest price with a 22 bid auction. The final bid came in at $536.99. 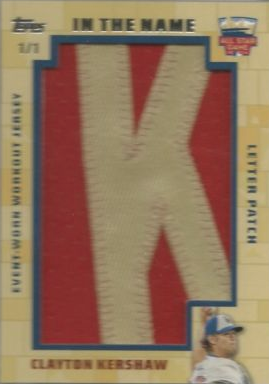 But some other In The Name Letter Patch cards closed this week, both Kershaw. These two cards ended at $400 and $315 respectively. But Series 1 Baseball took a back seat to the monster licensing juggernaut that is Star Wars. 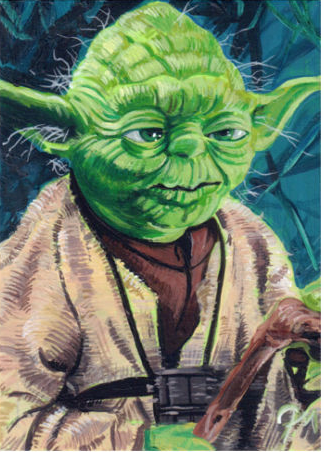 Topps released their highest end version of Star Wars cards yet with 2015 Star Wars Masterwork Trading Cards. 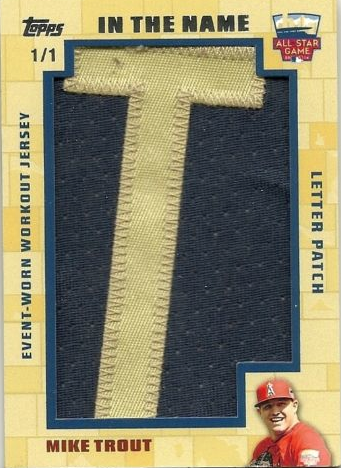 Entire Cases of these cards were moving on eBay averaging around $1,950. But one collector paid $50 more for just a single card. In a Buy It Now offering, this card sold for $1,999.95 and yes… shipping was free. 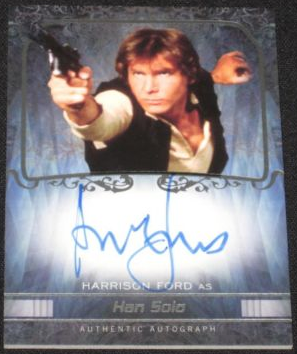 This card went for less than half of the Harrison Ford Auto in a Best Offer Accepted situation. Perhaps it was the $9.75 for shipping that hurt this card. Two sets were sold for $699.99 but one of them was not even complete. But if we covered Ford and Hamill, we can’t leave out Fisher. 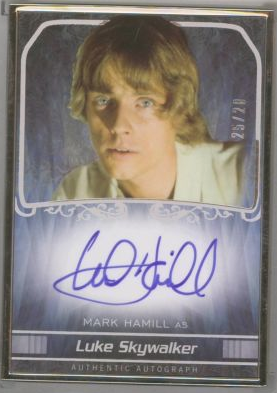 This card went for half the value of Hamill at about $500 in a Best Offer Accepted situation too. That was about the same price of the highest amount paid for a non-autograph card too. Also sold this week were these great looking sketch cards. Obi-Wan Kenobi and Yoda. Both cards were in the $300 range. There are still plenty of 2015 Topps Series 1 Baseball Cards auctions that are ending this weekend. Use this link to see availably and pricing. 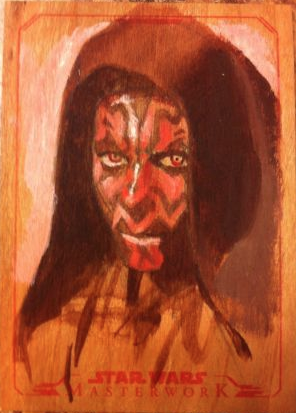 For Star Wars Masterwork cards more copies of the big name autographs are popping up. Use this link to see availably and pricing on those autographs. 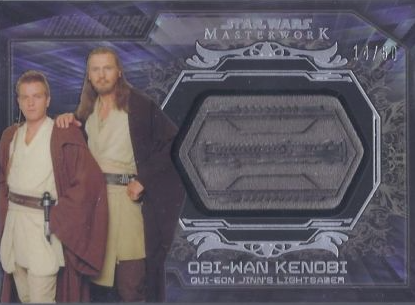 If you budget is more modest, some may say normal, there are definitely some reasonable listings showing up for some pretty cool cards, like this Light Saber Medallion card. Use this link to see that availably and pricing on those cards and others. We will continue to track these prices. If there are any cards you have particular interest in and would like us to track those too, just let us know in the comments below.